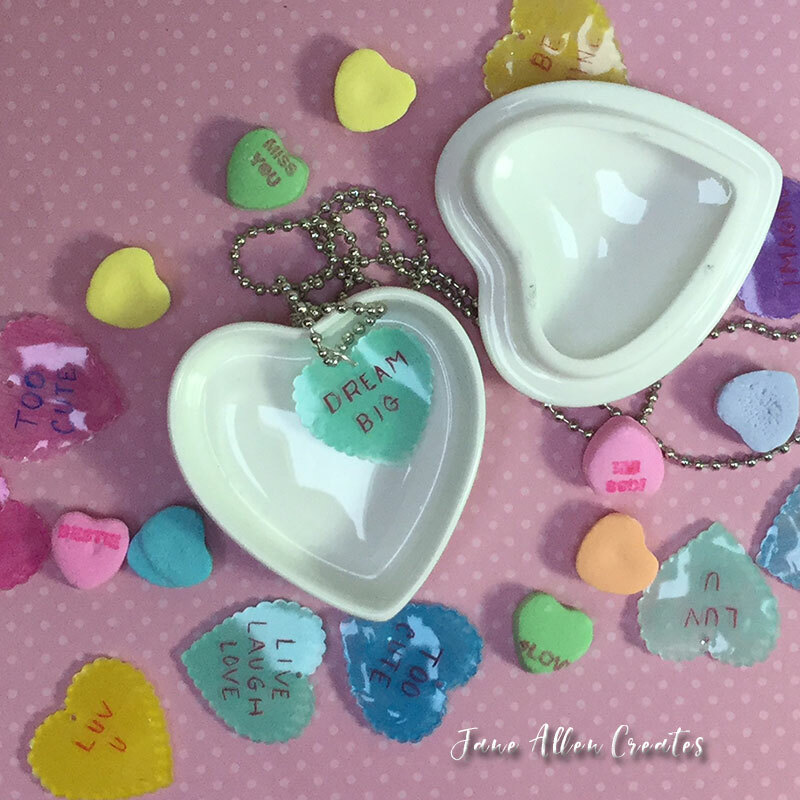 This is a fun little project inspired by those little heart candies that come out for Valentine’s Day with the sweet messages on them. It is a project that can be enjoyed by any age. I am starting with one of my favorite fun mediums – Shrink plastic. I like the frosted Ruff N’ Ready which you can get at Michaels or Hobby Lobby. You can cut out your heart, but I liked this 2 3/4″ heart punch which I got at Michaels. You will also need a whole punch, permanent ink markers and colored pencils. Cut or punch out your hearts and then punch a whole in the top center. I used a 1/8″ punch but you could also use a 1/4″ punch. This shrink plastic has a matte side and a shiny side. Since it is transparent you can print out the words you want on your hearts and then lay the plastic over the printout and trace the words. I just went for doing them freehand on the shiny side. At first I was using a number of different markers for the words, but then I remember the original candies were all printed in red. Allow the writing to dry and then flip the heart over to the matte side and color them with your favorite colored pencils. If you lost any of your lettering redo it before shrinking. Now for the fun part. You can use your heat gun to shrink them or you can place them shiny side down on a piece of parchment paper in a pan and bake them. If you are using a heat gun either place them on a wire in a board or in a box lid. Slip a jump ring through the hole and then slip your heart on a ribbon or chain. You could also make earrings or a charm bracelet with them. I am also seeing a book marker. I love all the possibilities with the words…I am seeing a lot of positive encouraging words. Hope you enjoy this project. Encourage someone with your “heart”. Thank you Charlotte, it is hard for me to keep focused on one thing because I want to do it all. Adorable. Such a great idea! I had no idea I could use my heat gun. That seems so much easier than baking in the oven 🙌 Thank you!! Thank you, depending on the size…larger ones work better in the oven. Thank you Effy, they are very fun. Love your shrinky dink fun! Thank you Amy, it is amazing what you can do with them. May i ask how long to bake them?